សត្វ (គឺជាសារពាង្គកាយអឺខារ៊ីអូតពហុកោសិកា នៅក្នុងអាណាចក្រអ៊ែនីម៉ាលៀ (ហៅផងដែរថា មេតាសូអា)។ Their body plan eventually becomes fixed as they develop, although some undergo a process of metamorphosis later on in their life. Most animals are motile, meaning they can move spontaneously and independently. All animals must ingest other organisms or their products for sustenance (see Heterotroph). Most known animal phyla appeared in the fossil record as marine species during the Cambrian explosion, about 542 million years ago. Animals are divided into various sub-groups, including birds, mammals, amphibians, reptiles, fish and insects. 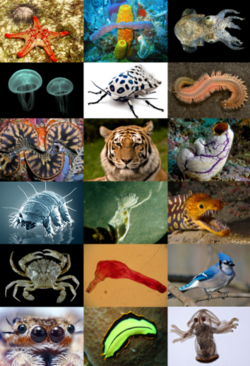 Animal Diversity Web – University of Michigan's database of animals, showing taxonomic classification, images, and other information. ARKive – multimedia database of worldwide endangered/protected species and common species of UK. Scientific American Magazine (December 2005 Issue) – Getting a Leg Up on Land About the evolution of four-limbed animals from fish.